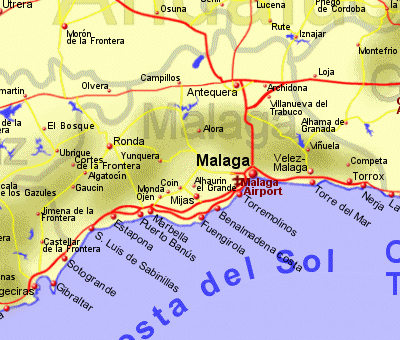 Malaga was one of the first provinces of Spain to develop it's tourism, and with good reason. Estepona, with low rise developments maintaining a Spanish feel and with a long stretch of fine sandy coastline. Puerto Banus, the up market marina which is home to many a large yacht belonging to the jetset, connected to Marbella to the east by the Golden Mile, where you will find many restaurants and nightclubs. Marbella, famous for being glamorous and attracting glamorous people from around the world has well maintained sandy beaches and a quaint old town contrasting with the modern boutique area. Fuengirola is a resort for any age group with clean sandy beaches and a lively nightlife. inland from Fuegirola is Mijas, a prety but very touristy Pueblo Blanco clinging to the hillside. Benalmadena Costa has been purposely built as a holiday resort with fine sandy beaches and lively nightlife with many bars and nightclubs. Torremolinos was the main resort on the Costa del Sol when the tourism boom started 50 years ago and at one point gained a tarnished reputation but much work has done on improvements since then. There are many hotels and plenty of nightlife adjacent to superb beaches. To the east of Malaga, the coastline is dotted with small villages with Nerja being the best known. Nerja has small coves, larger sandy beaches, and a typical Andalucian old town. The caves of Nerja are very popular with visitors together with Frigliana a little way inland, one of the pretiest villages in Andalucia. Malaga itself is a sizeable city with a population of half a million people and is the birthplace of Picasso - an important collection of his work being housed in the Picasso museum. The suberbs of Malaga now engulf a number of small fishing villages with small beaches and some fine seafood restaurants while the city iself is overlooked by the Moorish citadels of the Alcazaba and Gibralfaro. Other inland places of note include Ronda, located inland from Marbella on a craggy range of hills beside a canyon 180m deep spanned by a beautiful bridge ( Puento Nuevo) built in the 18th century. Antequera, north of Malaga, given that name by the Romans because even they thought it was old, home to 3 prehistoric monuments surviving today all thought to date from around 2500BC - the Menga Cave, Viera Cave and Romeral Cave. Casares, just west of Estepona, dates from pre Roman times and sits amongst hills growing pine and Spanish Fir trees. Inland Malaga has a numer of pictuesque lakes amongst the hills with including Lake Vinuela.